Find yourself slouching or hunching over? Or have years of sitting at a computer desk given you back and shoulder pain? Finally - there’s a solution that doesn’t involve spending hundreds or even thousands on repeated chiropractor visits. With the Back Posture Corrector Support Brace, it will help encourage and train your muscles to have better posture so eventually, it becomes natural for you to sit or stand with your back and shoulders straight. It also helps alleviate pain if you find you are experiencing strain on your upper back or shoulders. HELP YOUR POSTURE: - help you retrain your musculature and assure your back maintain an upright position, straightening your spine. RELIEVE BACK PAIN: Provides pain relief in the upper back area and you’ll have less strain on your shoulders. 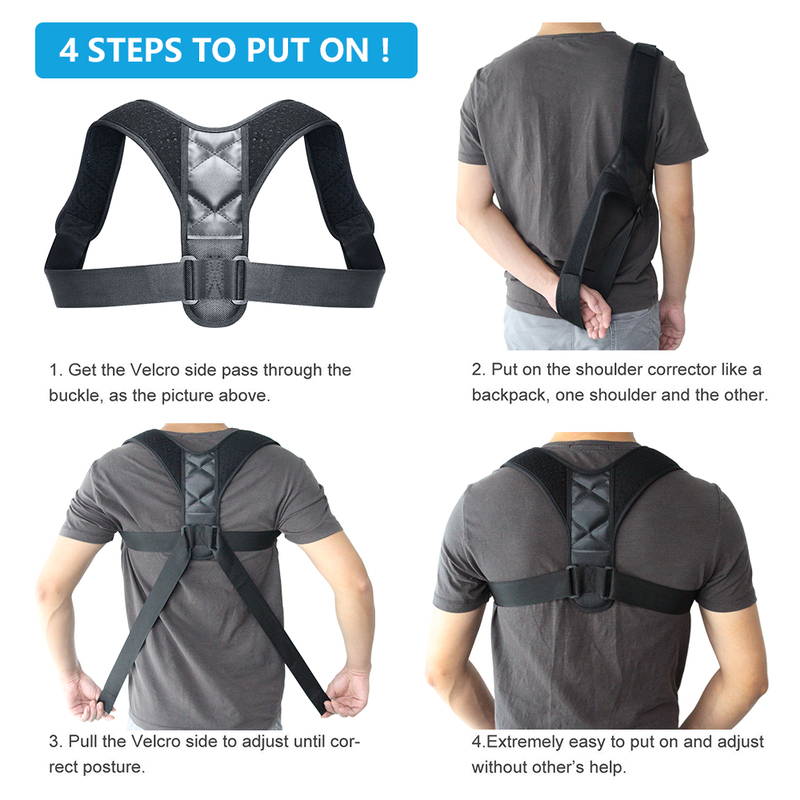 Wear our upper back support posture brace 1 or 2 hours, every day and soon you will start developing a muscle memory. The neck and shoulder brace posture is made of breathable Neoprene, which offers extra comfort. BOTH FOR MEN AND WOMEN: Adjustable shoulder stick straps with strong Velcro, it's easy to adjust for a perfect custom fit and its cushioned "soft-feel" spine makes it comfortable for everyday use. Fit for both men & women. HOW LONG SHOULD YOU WEAR IT FOR? -- You don't need to wear it for all day. Take it step-by-step (Start with wearing it for 1-2 hours a day) and once your muscles start supporting your back by themselves, you won't need a posture brace any longer (But you will probably need to wear a posture corrector for some time.) Just like you don’t have to focus on your muscles to breathe, you won't have to focus your muscles to support your back in a straight position.